The Peregrine Falcon, fastest animal on earth, once again shows its dominance over all others! Affectionately called Lady, this falcon easily surpasses skydivers with speeds of at least 180 mph! Journalist Steve Leonard ascended 10,000 feet on a hot air balloon, carrying a speedometer and a lure that Lady had been trained to hunt. Steve was buddied up with an experienced skydiver for a tandem jump. They clocked their free-fall velocity at the maximum speed their speedometer could record, they were falling at 150 mph! The diver’s jumped from the balloon and were then followed by Lady. She caught up to them in a matter of seconds! They figured she was just playing with them and must have simply accelerated, clocking a speed of at least 180 mph. The TV team, producers of the BBC “Ultimate Killers’ series, acknowledged that this was not a laboratory experiment. Still the demonstration was quite thrilling. The Peregrine Falcon is one fast animal, and the skydiving competition was like a walk in the park. Lady was in training for 6 years and had 6 months of practice with the lure for this ultimate experiment. These birds are known to reach dive speeds of up to 242 miles per hour. A speed of 150 mph is a lot for a skydiver, but could be just a nice cruise for the peregrine. When not hunting, this bird will generally fly between 40 and 60 mph. But when diving to catch its prey, the peregrine becomes a deadly predator. Diving at speeds up to 242 mph is possible because of a body structure that allows for specialized high speed flight. A large keel allows for lots of attached muscles, and that equates to flapping power. Its stiff feathers and extremely efficient respiratory and circulatory systems then allow it to flap its wings up to 4 times per second. 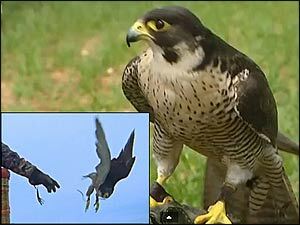 The Peregrine Falcon Falco peregrinus is the record holder for speed. Its dive speed is more than three times that of the Cheetah, the fastest land speed animal. The birds have some of the fastest types of animals alive but there are some other impressive high speed animals as well. Birds are the fastest animals followed by an insect species, then aquatic animals, and then land mammals, with reptiles taking up the rear. There is a great fascination with high speed animals, but how fast they actually go is often an estimate. There is a tendency to overestimate the speed of fast animals too, and different sources can be quite variable. These are the best estimates we’ve found to date. Golden Eagle Aquila chrysaetos can reach airspeed of 200 mph (320 km/h). Gyrfalcon Falco rusticolus can reach an airspeed of 130 mph (209 km/h). Swift Apus apus can reach airspeed of 106 mph (171 km/h). Eurasian Hobby Falco subbuteo can reach airspeed of 100 mph (161 km/h). Horse-fly, members of the family Tabanidae, can reach a speed of 90.1 mph (145 km/h). Tiger Beetle Cicindela eburneola can reach a speed of 4.2 mph (6.8 km/h). Although speedy for an insect, it doesn’t hold a candle to the horse-fly! Black Marlin Istiompax indica is the fastest fish in the ocean. It can reach a water speed of 80 mph (130 km/h). This speed estimate may prove to be even higher as this fish has been recorded stripping line off a fishing reel at 120 feet per second, which equates to 82 mph. Sailfish, members of the genus Istiophorus, can reach a water speed of 67.85 mph (109.19 km/h). Swordfish Xiphias gladius can reach a water speed of 60 mph (97 km/h). This is a hypothetical speed estimate calculated from a 600-lb swordfish embedding its sword 3 feet into the timbers of ships. It hasn’t actually by timed. Cheetah Acinonyx jubatus can reach a land speed of 70–75 mph (112–120 km/h). The Cheetah is the fastest land speed animal and has held that world record for the last 10 million years! Horse Equus ferus caballus can reach a land speed of 43.97 mph (70.76 km/h). Pronghorn Antilocapra americana can reach a land speed of 55 mph (88.5 km/h). This American Antelope is the fastest of the Antelope group, followed by the Springbok Antidorcas marsupialis at 55 mph (88 km/h), Wildebeest of the Connochaetes genus of antelopes at 50 mph (80.5 km/h), and the Blackbuck Antilope cervicapra at 50 mph (80 km/h). Lion Panthera leo can reach a land speed of 50 mph (80 km/h). Greyhound Canis lupus familiaris can reach a land speed of 46 mph (74 km/h). Jackrabbit Lepus californicus can reach a land speed of 45 mph (72 km/h). African Wild Dog Lycaon pictus can reach a land speed of 44 mph (71 km/h). Kangaroo, marsupials from the family Macropodidae, can reach a land speed of 44 mph (71 km/h). Free-tailed Bat, the Molossidae family of bats can reach a flight speed of 60 mph (96.6 km/h). Bearded Dragon Pogona vitticeps can reach a land speed of 25 mph (40 km/h). Leatherback Sea Turtle Dermochelys coriacea can reach a speed of 21.92 mph (35.28 km/h). Six-lined Racerunner Aspidoscelis sexlineata can reach a land speed of 20 mph (32 km/h). Black Mamba Dendroaspis polylepis can reach a land speed of 14 mph (23 km/h). There are all sorts of unique animals in our world, each with its own talents. Visit the Animal-World.com website to learn about the critter of your choice! Photo collage images courtesy of BBC Earth, taken from their Falcon Vs Skydiver – Ultimate Killers – BBC YouTube video seen above.